Candy Tours provides high quality 16 seat minibuses for hire with one of our friendly drivers, ideal for wedding parties, sports events, evenings out, corporate events, school trips and airport transfers. We also offer sightseeing tours and scheduled day trips for groups and individuals to destinations all over Southern England and beyond. 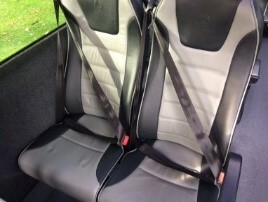 We pride ourselves on the high quality of our minibuses (cleaned to a pristine condition before each trip, air-conditioned, reclining seats and high ceilings), the reliability of our service, the quality and genuine care of our friendly drivers and the variety of trips we offer. So relax, let us do the driving and enjoy by joining us on one of our scheduled sightseeing tours or day trips, or book a minibus for your friends, family or work colleagues. We look forward to taking you and welcoming you on board our prestigious Candy Tours minibus. Day Trips | Pick-ups in Petersfield, Liphook, Whitehill and Haslemere 23rd May £51 Visit the magnificent Victoria and Albert Museum, and experience the Christian Dior exhibition.